About a year ago, we made a big decision. We’d grown quickly and were regarded as one of the top modern wedding planners in the UK. We loved our website and branding, and it had helped us through our amazing journey from start up to fully booked, but we realised it wasn’t what we needed to get to the next level. As Steve Forbes said – “Your brand is the single most important investment you can make in your business”, and we knew we needed to make that investment. So, we set about planning a shoot, not just any old styled shoot, but a set up that would be different to any other wedding planner’s style. It needed to be classy, but still modern. 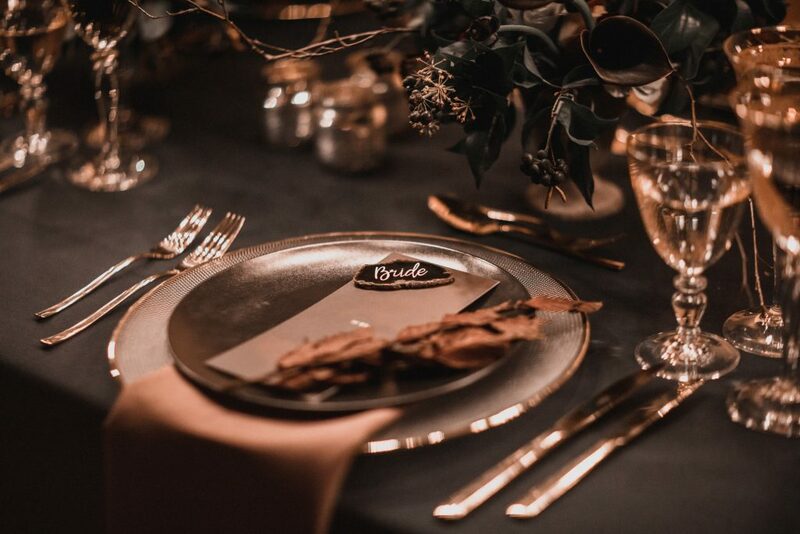 As a modern wedding planner, we know how to respect current trends and keep things relevant, but we still needed to ensure the shoot embraced a timeless aesthetic. We wanted to introduce design elements from eclectic sources such as fashion and popular culture to compliment our fundamental belief that real style never goes out of fashion! To create a shoot that echoed this ethos, we needed our dream team, comprising of suppliers we’d worked with in the past, or who we knew of and loved their work. More importantly, we knew they understood our vision and shared our commitment to creating unique and original events. Now with the team ready to be assembled, we needed a venue. Again, this needed to be completely on brand. After a lot of searching we found The Oriole bar in Smithfields. 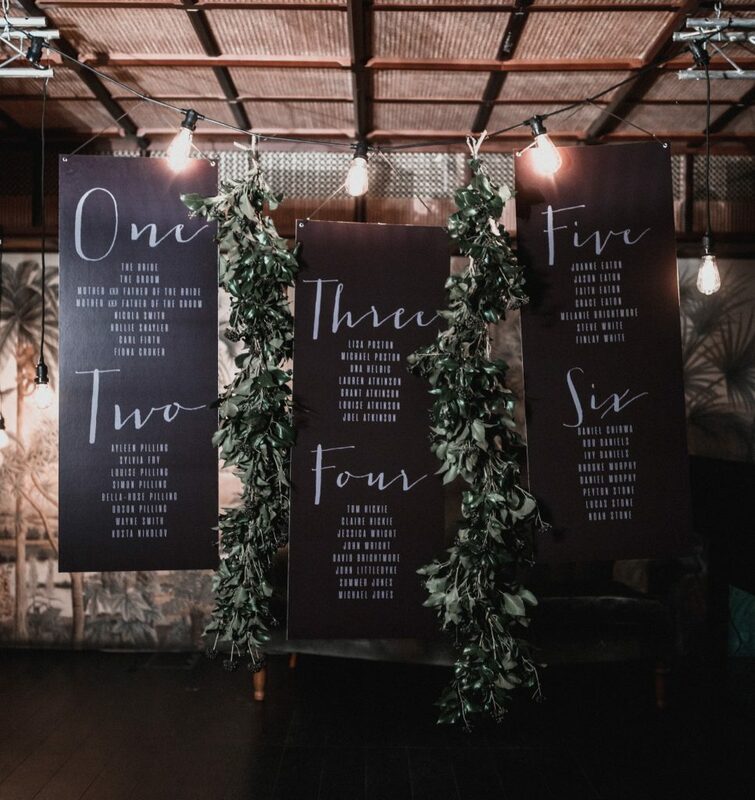 The décor was amazing, with a real speakeasy vibe, and plenty of striking backdrops that we knew would work brilliantly. However, part of its appeal was also that it was a bit dark, a bit moody, and very atmospheric. 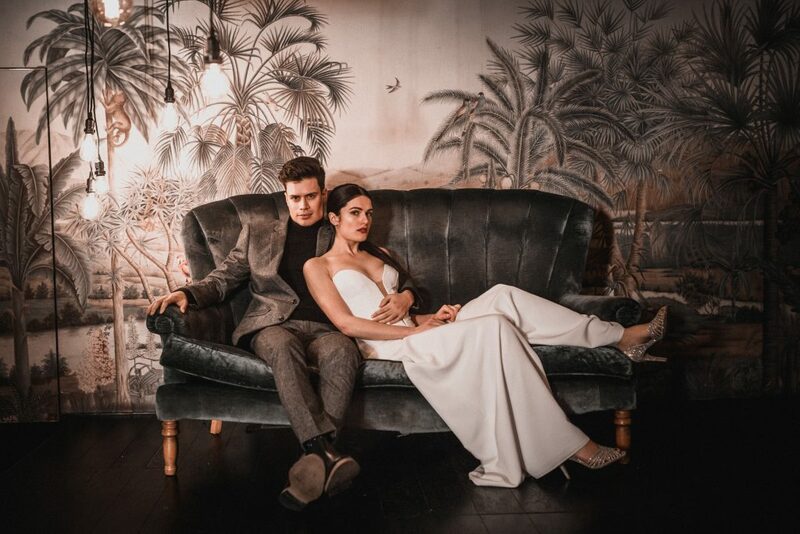 Whilst these traits are awesome for our style and what we wanted to create, they are not naturally a photographer’s ally, so we needed someone who could embrace these conditions and produce inspirational shots. Step forward Benjamin Wheeler who we had worked with on weddings before, and absolutely loved his work. So, venue and photographer sorted, how would we set about creating in reality the vision that existed only in our heads? 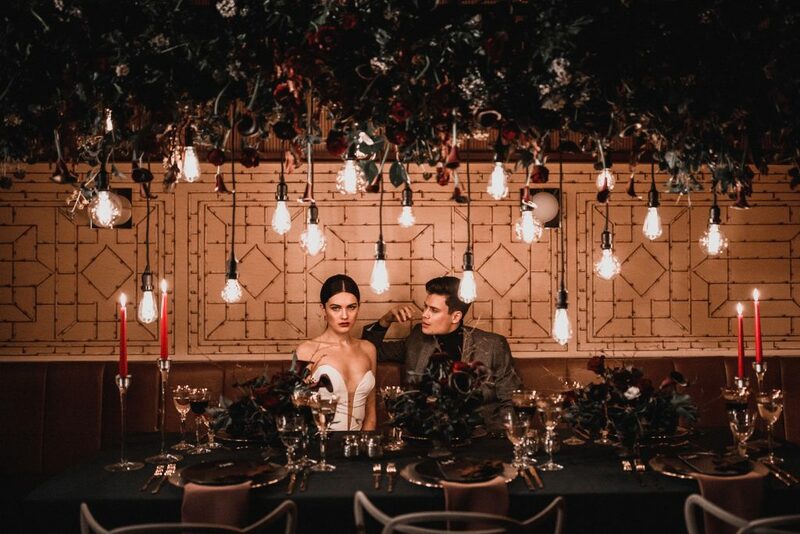 We knew we wanted epic lighting and floral installations, but more than that, they had to compliment each other to create one organic structure. This choice was easy! Emma Soulsby is a florist whose work is never predictable, and has worked with us on lots of weddings so she was on board. She set to work on creating a gorgeous, lavish backdrop of moody colours and textures, oozing sophistication. 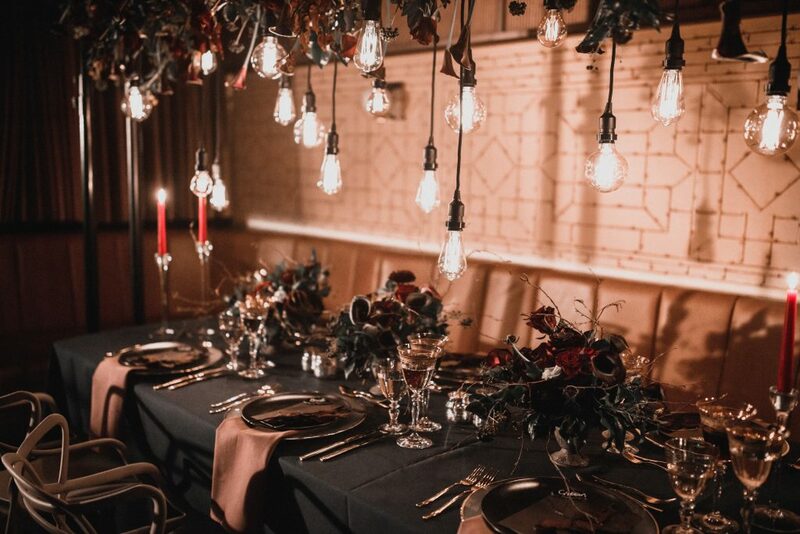 You can use this inspiration for your modern wedding – the colours perfectly suit an autumn or winter wedding, and create a sumptuous setting for your big day. 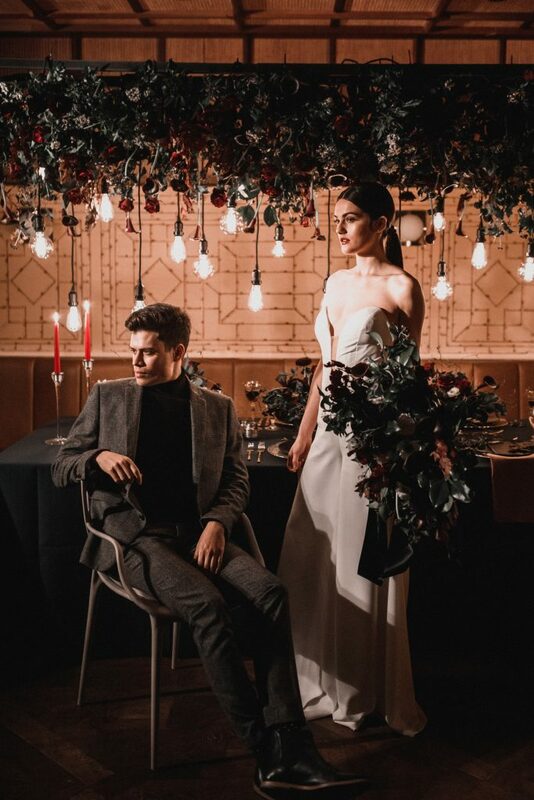 We then brought in the innovative Dreamwave events to create a hanging lighting installation that created a show stopping juxtaposition when used in conjunction with Emma’s flowers. The rest of the vision was brought to life with stunning stationery from BettyLou designs, bespoke bridalware (obviously not a dress for us but a one off sleek jumpsuit from Lenka’s Bespoke Bridal), a cake of dreams from Labelle Cake Company, gorgeous furniture from Wedhead, tableware from Couvert Hire and the stunning look created for our models by Mel Kinsman and Love Hair by Lou. Throw in the styling guru that is Jennifer from Raspberry Bespoke Events and we just could not fail! We are so proud of the end result, and in fact it exceeded our expectations of what we wanted to create. 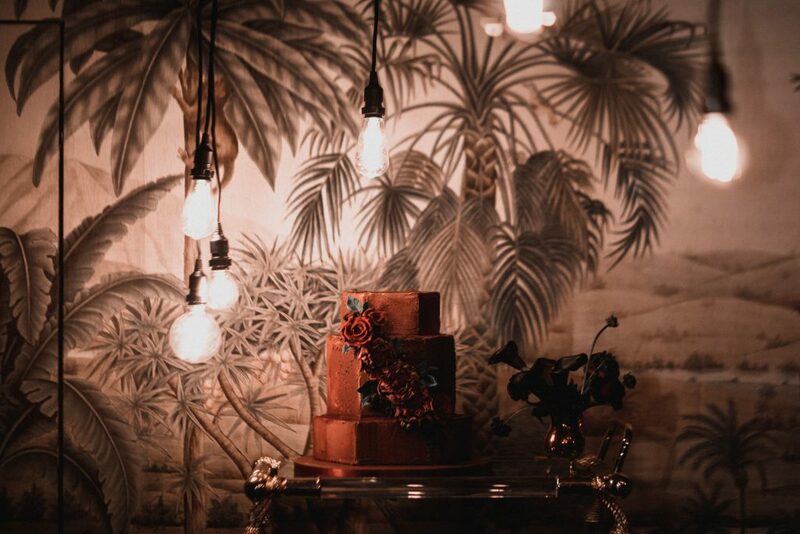 We believe it demonstrates that you can create a modern wedding and still retain a luxurious feel. It’s the perfect look for today’s fashion forward couples and we really hope you love it! (You can also check it out in the November/December issue of You and Your Wedding magazine). Please contact us for more information on how we can work with you to make your vision a reality.